I've released an update to the Vigilance theme. It fixes some issues with the archives and some other issues with the sidebar. 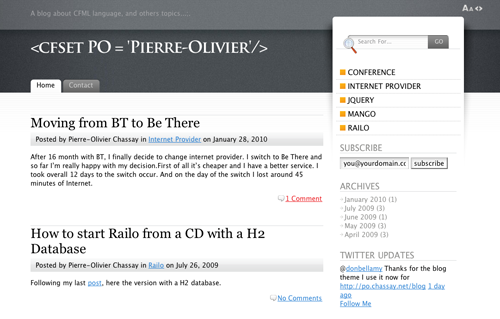 This update requires Mango 1.4.2, so you'll need to upgrade Mango before using the updated theme. To download, go to your administration and then to the Themes page. You should see a notice about the update, and a link to download. The zip contains a readme file with some notes about the sidebars and what is included in the update. Do you want to keep updated with Mango's new plugins, releases and other news? You now can, with John Gag's Mango News plugin. You can read more and download from John's blog. Don Bellamy has created a plugin that allows you to password-protect pages. You can read more and download from Don's blog. Don Bellamy has created a free theme called Fusion. You can download it from Don's blog. Mark Aplet has created a plugin to add easter eggs to your blog. It includes setups for Rick Rolling, and some of the more popular Konami Code services like Cornify, Ninjafy, Sharkify, and Nippleit. You can read more and download from Mark's blog. Blogo is a really simple and easy to use application that allows you to make blog posts from your desktop. As a test, I am publishing this from it to see how it works. It was able to upload pictures and it picked up the categories, but the selected category was not applied to the actual post, neither did the custom date.